Don't know where to makan for lunch? Follow your taste buds… and your wallet. 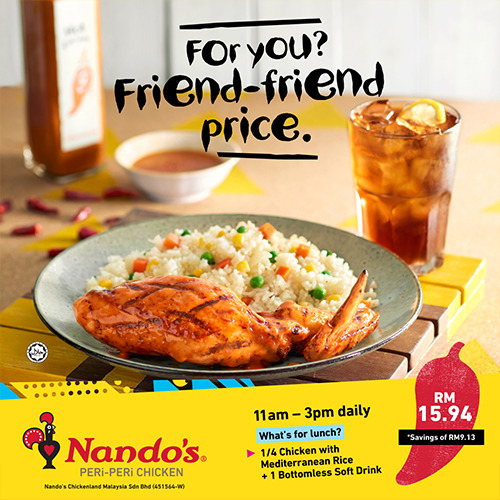 Enjoy a 1/4 PERi-PERi Chicken, Mediterranean Rice & a bottomless soft drink for RM15.94, everyday 11am-3pm. Visit Nando’s at lot number and fill your tummy with PERi-PERi Chicken today! Products shown are for illustration purposes only. This promotion is for a limited period only. Prices displayed are inclusive of 10% service charge. Prices are further subject to 6% SST, but SST is not applicable to service charge. Copyright © Jelas Puri Sdn Bhd (684744-H). All Rights Reserved.